NorthEast United FC (NEUFC) striker Bartholomew Ogbeche shines as NEUFC registered a 1-0 victory over Chennaiyin FC in the 2018-19 Indian Super League (ISL) season at the Indira Gandhi Athletic Stadium in Guwahati on Saturday. Ogbeche scored the only goal of the match in the 87th minute and sealed the crucial three points for the home side. According to match report published on Saturday by Goal.com stated Rehenesh TP featured for the first time since early October when a four-game suspension had pushed him down the pecking order. Mislav Komorski was available for selection which meant Juan Mascia had to sacrifice his place for Komorski, the young Puitea. On the other hand, there were six changes for Chennaiyin FC. Calderon and Salom were not included in the squad. 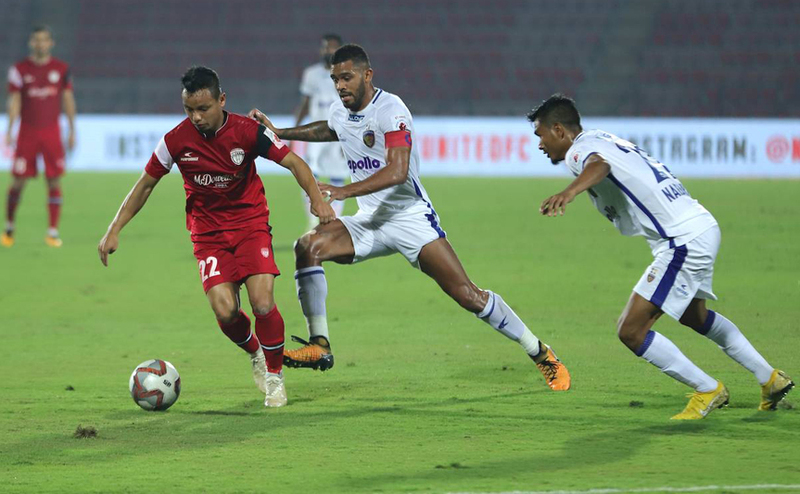 Anirudh Thapa and Jeje Lalpekhlua had to be content by warming the bench while new signings CK Vineeth and Halicharan Narzary slotted right into the mix. It was Chennaiyin who started outbrightly with Augusto scampering a half chance after dashing past two defenders in the NEUFC box. The momentum shifted to NEUFC quickly after the opening quarter of an hour. However, they would have felt hard done by with referee Santosh Kumar turning a deaf ear to an appeal for a penalty in the 19th minute of the game. Germanpreet brought down Gallego with his sliding challenge inside the box as the Uruguayan chased a loose ball. The Highlanders continued to pile up pressure on their opponent through Ogbeche and Gallego but failed to find the back of the net going into the break. Even after the change of ends, Gallego had twin opportunities from free-kicks but both efforts failed to work out. Tondonba made a goal-line clearance from Redeem Tlang’s efforts that managed to keep Chennaiyin in the game with 15 minutes to go. Panagiotis Triadis, a new signing, was brought in and showed some promise in the attack but goalkeeper Karanjit managed to see out his feeble attempt from inside the box. The breakthrough in the game eventually came late in the tie. Puitea played a square ball to an unmarked Ogbeche who dropped shoulders from 30 yards out and unleashed a vicious left footer that blazed the top corner of the net to provide his side all three points from the match. NEUFC leapfrogged FC Goa to third position on the table with 23 points, having played two games more than league leaders Bengaluru FC.